Bob Tucker is the Chairman of Trade Coast Central, a company developing an innovative high-tech industrial subdivision adjoining Brisbane Airport. He is one of Brisbane’s major property developers specialising in industrial and retail developments. 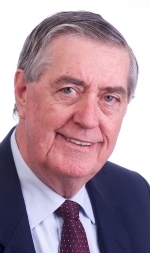 Bob is a former state president of the Queensland Liberal Party. He graduated from the University of Queensland with a B Pharm Bsc, subsequently founding Green Spot Chemists.